The only immaculate things on campus I can think of are the shirts and trousers of the Indian students, always perfectly ironed. The campus of NUS (National University of Singapore), where Philippe and I live at the beginning of 2017 looks like a luxury retirement home for adolescents. There are even those little cars to move from one area of it to the next, a free service of shuttle buses, a swimming pool, museums, restaurants and shops. It is immaculate, just like a golf field: the grass is green of an enhanced green; the air is clean of an orchid-scented cleanliness; the flora equatorial: I have rarely seen anything as sumptuous as a Singaporean rain tree. The NUS campus is different from the campus of my Taiwanese university: greyness, nano-nerds, the usual all-around lack of glamour and ugly architectural pastiche. In Taiwan, rubbish trucks run the streets twice a day announcing their arrival to the sound of Beethoven’s “Für Elise.” You hear them and run down the stairs with your bags of garbage. My Taiwanese campus smells of honey waffles, a snack popular with students: dirty stray dogs, youthful chaos, bicycles and umbrellas. The only immaculate things on campus I can think of are the shirts and trousers of the Indian students, always perfectly ironed. Here in Singapore, it’s difficult to tell if the students in Starbucks are studying or shopping online. I hear them talking of Alibaba and their assignments could very well involve online shopping. Western students mostly wear flip-flops, a tan, a fresh blow-dry, and that beach shabby-chic Roxy type of attire that only girls as flat as surfing boards can pull off. They are so young I am sure no one of them has ever asked the time to a random person in the street. Some students wear a helmet to mono-cycle from one building to the next, even if the worst possible danger is falling on a patch of green grass. NUS is a Stepford campus, filled with silent warnings, slogans and admonitions. From the campus swimming pool, one can see newly-built buildings, each one carrying a luminous catchword: create, achieve, succeed, innovate…The university offers financing to students’ start-ups, so that on campus there is an area of start-up incubator-houses, each house mysteriously locked, and in front of them someone is recreating a full-scale ocean-wave in a pre-disposed area. Some time ago, I saw a poster advertisement for the university: the usual bunch of multi-ethnic students holding fake books and folders. The slogan went: “NUS, no boundaries, only opportunities.” Just like that. As if there could be opportunities without boundaries: as if opportunities were not actually built on boundaries, as if it was ok to lie to students. In Italy there is no such thing as consistently beautiful contemporary architecture, there is mainly the beautiful old and the ugly new. Singapore is beautiful, within and outside the campus, a superb city-state built by immigrant labour workers. During the day, we see several of them sitting on the grass, picking up the dry blades from the green one by one, under the equatorial sun. In the evenings, I sometimes see them going back to their dorms sitting in small trucks. Those trucks look like Taiwanese-unglamorous pieces of reality in an otherwise uniform spectacle of luxuriant wealth. Singapore has a special sun, blinding and potent, a light constant and without pause, just like the equator. Philippe dislikes Singapore to an extreme degree; he finds it robotic, and it’s too hot for a Quebecois. At the moment, we are both applying for as many postdoctoral fellowships as we can: an activity so time-consuming and alienating that it has made me resume my exacting ways of going around by myself. But in this heat it’s not always easy. I feel this city is a giant microwave oven that cooks me from the inside: my guts first, so that I wake up wanting to do things, and I find my body doesn’t have the energy to follow. I have seen, so far, a patch of pluvial forest inside the botanic gardens, old Indian and Arab quarters that look like abandoned theatre wings, so small next to the new buildings, like old wooden children toys scattered around a newly furnished living room. I have seen a park of and for birds, frangipani trees, buildings shaped like durians, and shopping malls made to impress. For an Italian person, Singapore can be quite unsettling, because its architecture is contemporary and beautiful. In Italy there is no such thing as consistently beautiful contemporary architecture, there is mainly the beautiful old and the ugly new, an opposition that has solidified into a persistent prejudice against contemporary constructions. But in Singapore, when you lift your head, you are likely to see sky-high gardens coming out of glass buildings, imposing but light, sometimes decorated with waterfalls of vegetation pouring to the ground. Recently, Philippe and I went to a pub in an office area full of western expats. Some people, most of them wearing a conference pass, were having a drink after work and the atmosphere was positively British: the drinking and smoking and chatting while standing, the language, the blondness. One single ray of light was cutting the scene into two halves: London in a Singaporean Light, I thought, like one of those capriccios I used to see at the National Gallery during my lunch breaks. There is one, for example, of St. Paul Cathedral towering at the end of a Venetian canal, a beautiful contrast, the imaginary encounter of two worlds that at the time of the painting were probably perceived as distant as Europe and Asia. Singapore made me see that I have developed, over time, a form of mature affection towards Taiwan, probably deeper than I like to admit. Maybe it was inevitable after six years there. I left for Taiwan in the summer of 2009 only because, after my Master, I won a scholarship to study Chinese at the Mandarin Training Centre in Taipei for a few months. My plan was: see if you like Taipei, if you do, you could stay and do a Ph.D. there, if you don’t, you will apply from there to other places. The most important thing for me, at the time, was the Ph.D., as I felt I wanted to keep studying. And, as it’s often the case, an unexpected combination of all this took place: I didn’t like Taipei, and I stayed. At the Mandarin Training Centre I met Philippe, just a few days after my arrival. We used to spend long afternoons talking in coffee places, especially Cavaralli, an unusually Italian-looking coffee shop in the centre of Taipei, a successful capriccio nearby the university. Philippe convinced me to stay with a calm but repeated invitation to give Taipei a chance, stay open to new possibilities, and continue our friendship. Singapore made me see that I have developed, over time, a form of mature affection towards Taiwan. One recurring image is him as a young boy, walking slowly on snowy streets wearing a baseball uniform. I am older than him, and I sometimes picture our lives in parallel between Europe and Canada during the years before we met. What was Philippe doing while I was going through my divorce? One recurring image is him as a young boy, walking slowly on snowy streets wearing a baseball uniform. Of course, this is a stupidly exoticized image that by conflating snow with baseball reveals very well my crass and undetailed knowledge of his country (as if anyone in Quebec would play baseball in winter). My primary school used to be next to the Coliseum, his in a pine tree forest; my childhood apartment used to be heated, in winter, by the oven of the bakery downstairs, Philippe’s house was very warm and yellow inside and very cold and white outside; my summers were spent at the beach, Philippe does not know what this means; Philippe didn’t know, until recently, that ice cream and amaretto di Saronno go well together and he didn’t know the taste of figs. I didn’t know Italian grocery shops in Montreal and I had never seen, before going there, any Inuit art. I didn’t know that there are, in the world, dedicated traditional bagel shops, that you can eat maple syrup with snow and put it in your salad, that cold air can make breathing difficult, racket shoes and salmon cooked with mustard. One evening, in Taipei, I made a dessert that was meant to represent our encounter, a culinary capriccio: maple syrup tiramisu’, unfortunately not particularly memorable. Philippe and I moved in together in Taipei just after a few months we got there. Everything worked smoothly from the beginning: Taipei, somehow, always made me function well, it always kept me busy throwing opportunities at me. Most of my time there was divided between my Ph.D. and two teaching jobs. I went through three full years of intense course-taking (mostly in Chinese), exams, and an Italian teaching job in a private school. In 2011, I started teaching Italian at National Taiwan University, the university where Philippe was taking his master’s degree. I only interrupted all these activities once, for several weeks in 2012, because I had to have an operation. Several tumours had to be urgently removed from my uterus. They came at a moment of intense happiness and productivity; not to punish me, I am not saying this, but to remind me of something: the consequences of old problems can present themselves again after a long time, as familiar memories of somebody else. The drugs and painkillers I took after the operation had a devastating effect on me, making me cry and panic. In my hospital bed, I had a dream in which I was walking on a white and sunny beach, but there was no sand, only small pieces of glass that made my feet bleed. I could only keep walking to get somewhere safe, but I couldn’t move forward because of the pain. I woke up with a taste of glass and blood in my mouth. Over time, I have understood that I am too prone to anxiety, panic attacks and claustrophobia to react well to substances that unsettle me, I can do it only gently. Wine is fine, but a pill of morphine shuts my brain down a well too deep to breath. I remember I was given a large quantity of pills when I got dismissed from the hospital, and I threw them all away. If it is even remotely bearable, I prefer physical pain to desperation, and truth to denial. My mother flew to Taiwan on that occasion, and Philippe, who had only met her once in Italy, took care of her. He didn’t panic, he just did it: he took her out to lunch and dinner, ordered food for her, and gave her his side of our bed. They must have gone through very long silences, since at the time Philippe couldn’t speak a word of Italian and my mother’s English is not fluent. I still sometimes picture them trying to communicate in a restaurant: a little English, a little French, a little Italian, my mother in Taipei, taking the underground, going to the local market, and dining in a Japanese ramen place with my Quebecois husband, another multiple funky capriccio, and it’s just so easy to love them both. It took Philippe and me a long time to recover from the operation; it felt long especially because we were expecting a sudden positive change: we both expected me to heal in a relatively short time, leave it all behind, and start again as strong as before. I had the operation in May 2012, after which I went back to Italy for a period of recovery. During one of my routine visits there, I discovered my hyperthyroidism, my autoimmune disease, and what it was doing to me. Simply put, my immune system had been attacking the body’s own cells and organs. The wings of my thyroid, a butterfly-shaped gland at the front of the neck, had been chewed away at by my own blood cells. The thyroid’s wings are rounded, not geometrically sharp, and now they were even less even. I woke up with a taste of glass and blood in my mouth. I remember one of them using a popular Roman expression, telling me I was ‘fuori come un balcone’. The doctors asked me how long I had been in that “state,” and I honestly had serious trouble understanding what they were talking about, I could not tell the symptoms they were referring to apart from what I believed were very familiar and not so odd personality traits of mine. Apparently, I had been in that “state” long enough to confound it with the rest of myself. I remember explaining myself nervously to them, moving my hands, shaking a little, and occasionally drying the sweat off of my forehead with my fingers. Sweat would come out suddenly, in large quantities: not drops, more tequila shots. I kept asking “what do you mean, I have always been like this, this is me: I have always talked like this.” I explained to them the excessive sweating the same way I had explained it to myself: I had always suffered the heat a great deal, my brothers too, but it turned out that that too was a recognized symptom of the disease. I suddenly recalled all the times I would go for short invigorating walks in London under the snow wearing a t-shirt and jeans over bare legs. People who knew me generally thought I was showing off, but I didn’t feel a thing. My legs, especially, were insensitive to the cold. I took it as a sign of health, of good blood circulation, and this is what I told the doctors. I remember one of them using a popular Roman expression, telling me I was “fuori come un balcone,” “as out as a balcony,” out of my mind. In Taipei, as soon as I arrived, at the end of summer of 2009, I started losing hair in the shower, a lot of hair. At some point, a small bold patch appeared at the top of my head. I had gone through a period like this already, after my divorce, therefore I attributed the hair loss and general nervousness to the stress of relocating once again to a new place. Still, I got scared of losing more hair, so I cut it short, by myself, and wore it short for a few years. I was finally able to put together a few past episodes, strange ones. I have always lived together with my anxiety and apprehension, with my heart held firmly in my throat, as we say in Italian (il cuore in gola). As all healthy people, I just didn’t think I could be sick, not even the time I ordered a cappuccino at a 7/11 and a sudden spasm in my arm made me throw it to my face. I couldn’t have done it more disdainfully if I had done it on purpose. I told myself it was something that must happen all the time to other people too. Philippe told me that when he met me once in the university locker room, he got almost scared by my breathless way of speaking and fumbling with books and the locker key, apparently I was behaving as I was being chased; a colleague at work told me we once took the lift down together, and she thought the lift was too small to contain us two as well as my heavy breathing. As soon as I was diagnosed with my autoimmune disease, I was prescribed 6 pills a day to calm my thyroid down. I remember the idea of assuming such a quantity of medicine scared me very much, but then, after maybe two days of taking it, I thought I could not live without it. The immediate effect was a diffuse sense of peace for my heart and my brain. I didn’t recognize myself and I didn’t see a way out. When you live with my type of anxiety, as you wake up every day, you go through the same thought-routine: the things done and the things to do, those that should have been done and those that will never be done. The only way I knew of calming myself down was obsessing regularly over all this, so as to keep everything under control. A couple of days after I started the cure, as I tried to consume my first morning energy with this activity again, I found out that that door had been closed, I simply could not mentally reach the things I was obsessing over, I could not repeat the routine. Of course, I knew perfectly well where those thoughts were, but someone had removed the key to that mental drawer. I tried to force it a couple of times, but then I gave up, frightened a little and much relieved. Methimazole made my legs and arms hurt. Once, I got up from a restaurant chair and fell heavily on the table in front of me. I was emotionally weak, prone to crying, on edge. My belly was still massively swollen from the operation, I didn’t recognize myself and I didn’t see a way out. It took me a long time, a lot of hot yoga, and a lot of pretending that things were improving to actually start feeling better. Now that I am really better and I have left all that behind, I think I should have taken my recovery more seriously, rather than acting as if every day was going to be the last day of it. Over that period of time, I still managed to do good things, work, travel, and be otherwise happy, but I dealt with the post operation time, the long scar it left on my body, and the heavy cure for my thyroid in a rush, with a sense of fear and defeat that I swept quickly under the carpet in order to become productive again. I have come out of it older, that’s for sure, not in the sense of wiser: I don’t think the disease has actually taught me anything fundamental, I am just older. Over the last few years, I have seen many doctors: gynaecologists, endocrinologists, nutritionists, eye-doctors, Chinese traditional medicine doctors, reflexologists, but I have never met anyone who could or dared to offer a comprehensive diagnosis of my state of health, no one who ventured to link the dots and give my symptoms a recognizable shape. I always want to know the truth, even when it’s not a good idea to know it; I am always looking for the complete picture, the ultimate reason, the final explanation. My first marriage crumbled under the weight of denial, mainly mine, and this caused a deep fear of it in me. I know perfectly well this is not always the right way to proceed, as there is never only one explanation for anything. And maybe it is not that important to actually discover how the butterfly took shape: which one is the first dot? What started the chain? Did hyperthyroidism cause the development of fibroids in my uterus? Did it work the other way around? Why do I produce too many hormones? Does anyone know how to link the dots? In my case, along the lines that link the seven dots of the butterfly, one could write: endometriosis, fibroids, hyperthyroidism, Graves disease, ophthalmopathy, insulin resistance…Even if I could have answers to all these questions, I doubt they would reveal the geometric shape of a child drawing; they might more luckily reveal a cloud of knots chewed away at its shaping lines. Since 2012, after the operation and a period of despair mainly due to a complete unfamiliarity with health issues, I have tried to do all I could to heal, and a number of problems got resolved. There was a constellation of them, a cloud and a fog, just like the Milky Way of tiny nodules in my throat. Luckily, my eyes healed, they returned inside their orbits and lost a patina of greyness that came from sleeping for years without closing them, a bigger nodule in my thyroid and a cyst in my uterus have disappeared with time, healthy diet, hot yoga and jogging. I have always felt strong, and I still do, energetic and supported by a strong body. ‘Egg today’ people are often considered to be greedy and impatient, but this is a simplistic and, if you ask me, unfair reading. At the time, I was not even relieved to hear this, as I didn’t have the time to even consider that option, I was only surprised at the statement. Now, I think of that moment as a most defining one. As it often happens, however, being diagnosed with health problems, and, as in my case, with high chances of ovary cancer in the future, made me think. I will not go into deep considerations on the fugacity of life, but I will only say that since 2012 I have become an even bigger fan of the “uovo oggi” (an egg today) as opposed to the “gallina domani” (a hen tomorrow). There is a popular Italian saying that presents you with the two options, and the choice you make is somehow expected to be revelatory of character. “Egg today” people are often considered to be greedy and impatient, but this is a simplistic and, if you ask me, unfair reading. I think I have always been an egg today kind of person mainly out of apprehension, but my recent history has made me definitely seal the deal: I am convinced that loss of a greater benefit is much easier to bear than a total loss. I have become very distrustful of the notion of tomorrow, but I truly respect and sometimes envy all those people who perceive and live life as a reliable opportunity for hen collecting. Good for them. I am now getting close to the end of my cure. I will soon have to stop taking the medicine and see if my thyroid has healed. If it hasn’t, I should have it removed surgically. My mother does not have one any longer, she is under hormone replacement therapy, and she does not suffer because of it. But the operation was not pleasant for her. I started my cure in 2012 with 6 pills a day; in 2017, I am only on half a pill a day. If it was up to me, I would prefer to keep taking the medicine indefinitely. I have found a balance that works for me, and I don’t want to change it. I prefer a pretty butterfly with chewed wings in my throat to no butterfly at all, or, if you prefer, I choose an imperfect balance today to the promise of a better tomorrow. 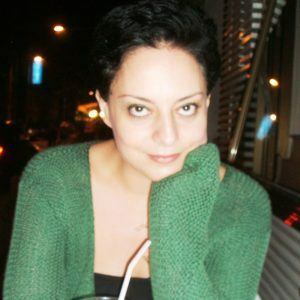 Francesca Pierini is a postdoctoral fellow at the Institute of European and American Studies, Academia Sinica, Taiwan. Adjunct Assistant Professor of Italian at the Department of Foreign Languages and Literatures, National Taiwan University (2011-2015), she was an International Scholar at KU Leuven in the academic year 2015-16. So far, Francesca has published four other short pieces of creative nonfiction: “Onions, Sulphites, and Panic Attacks,” (Spadina Literary Review, October 2016) “Red Bialetti” (ViceVersa Online, February 2017), “London Galleries” (Spadina Literary Reviews, April 2017), and “Taipei” (the Raven’s Perch, June 2017).